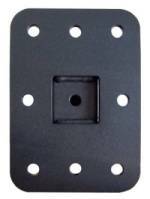 - Hole Pattern for monitor: VESA 75 x 75mm & 100 x 100mm. This heavy-duty 12.5" long LCD Wall Mount Arm & Bracket, comes with all the necessary hardware, including special wall anchors, a level and an oversized Allen wrench for torque adjustment. When used straight, the monitor's rear cover will be 12.5" from the wall. 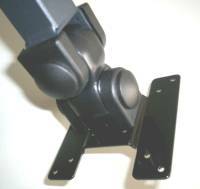 This arm has 3 points of articulation: one the base and two behind the VESA monitor mounting plate. The image above shows the strong 1/8 thick steel base, with 8 mounting holes. Click here for more specs. 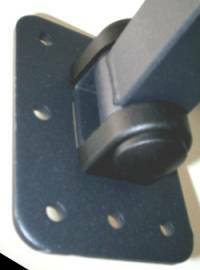 The 2 points of motion behind the VESA mounting plate are shown above. The torque of all these articulations can be easily adjusted using the supplied Allen wrench, so as to accomodate the ease of movement to your individual preference. Simply remove the protective caps and adjust the torque bolts. The VESA plate includes the two most popular monitor hole mounting patterns: 75 x 75 mm & 100 x 100 mm. Call us if you are not sure if your monitor has this hole pattern (have the model of you monitor handy). 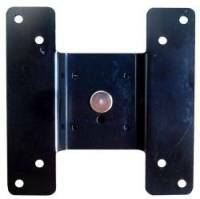 * For shorter reach applications, with the same swivel, tilt and rotating capabilities, we recommend our D170B Wall Mount Bracket. 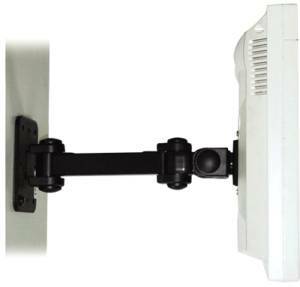 * For a flush mount installation, please see our D172A Flush Mount LCD Monitor Bracket.